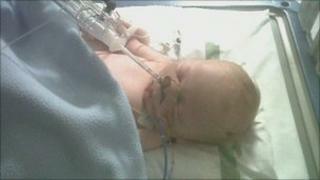 A five-week-old baby from Greater Manchester is seriously ill in hospital with swine flu, it has been confirmed. Harvey Flanagan, from Stockport, is being treated at the Royal Manchester Children's Hospital. A spokeswoman said he was in a "serious but stable" condition. Harvey's parents have said he was sent home from Stepping Hill Hospital, Stockport, twice after doctors failed to diagnose the illness. The hospital trust said it would contact the family. Harvey has now been taken off life support and had his first food for five days. His parents had been told he had a bit of a cold and too much acid in his stomach. "If I had listened to Stepping Hill, Harvey wouldn't be here," he added. Eventually the couple took the baby to Tameside Hospital where he was treated immediately for hyperhermia and later diagnosed with swine flu. The baby was then referred to the Royal Manchester Children's Hospital. In a statement, Chris Burke, chief executive of Stockport NHS Foundation Trust, said: "The trust is concerned to hear about Harvey Flanagan's situation. "We will be contacting his family to discuss directly with them any concerns they may have with regard to the treatment received by Harvey at Stepping Hill Hospital." Health officials have urged anyone in vulnerable groups to get vaccinated. They include those aged over 65, those with a long-term condition, carers and pregnant women. This year's vaccine protects against three strains of flu, including H1N1 (swine flu). There have been reports of several people dying, having contracted swine flu in north-west England in recent weeks.